There's a feeling and intuition that comes when you're in situations that demand your full attention. The Instinct is a compact, wearable fixed blade knife that is made just for those times. Available in two sizes and two handle types, it is suitable for many people. The Instinct offers multiply carry options. It can worn around the neck with a lanyard. There&apos;s a feeling and intuition that comes when you&apos;re in situations that demand your full attention. The Instinct is a compact, wearable fixed blade knife that is made just for those times. Available in two sizes and two handle types, it is suitable for many people. The Instinct offers multiply carry options. It can worn around the neck with a lanyard. It can be clipped to a belt or boot with the multi-angle adjustable clip. It can also be secured to a vest or bag with its many attachment points. 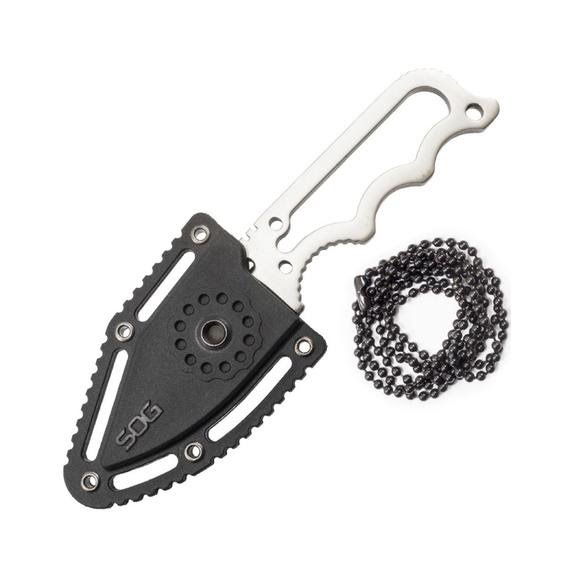 When your first instinct is to go for a blade, consider the SOG Instinct. 8Cr13MoV is a Chinese stainless steel with a high performance-to-cost ratio, often compared to AUS-8. Tempered around the Rc53 to Rc57 range. Clip Point is a great all-around format and one of the most popular, used on most bowie knives. The blade shape uses a concave or straight cutout toward the tip.